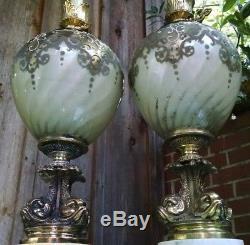 For your consideration is a sensational looking pair of Hollywood Regency Gold Gilt Bubble Table Lamps with Koi Fish Feet as part of an Elaborately Decorated Pedestal for your elegant apartment or as Mid 1900's period movie props. 44.5 tall to the top of the finials. 32" high to the top of the bulb socket, which sits atop the "candlestick feature. 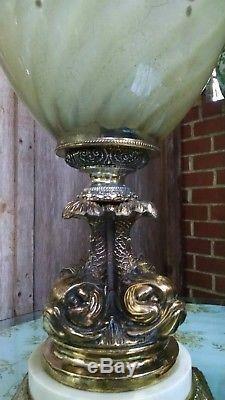 26" high to the top of the gold gilt metal leafy flourishes around the base of the "candlestick feature. 10 wide across the glass globe. 8 wide across the square base. For more information, please ask. 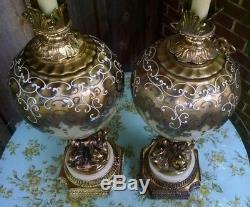 Item: Table or Buffet Lamps. Features: Large Glass Bubble, Hand Painted Decorations, Gold Gilt Metal, and a Stunning Quad of Four Koi Fish atop each Pedestal Base. 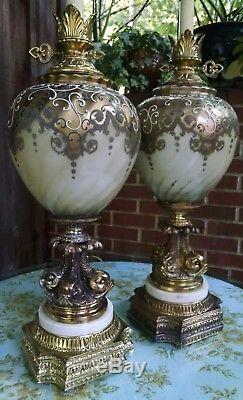 Period & Style: Mid Century Period / Hollywood Regency Italian Style. Weight: Approximately 14 pounds each (one is slightly more heavy, and the other slightly lighter). 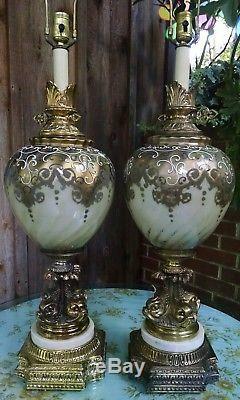 Primary Materials: Hand Painted Glass Globe and Gold Gilt Metal with marble in the base plus plastic finials & "candlestick" feature. Hallmarks: None that we could find except for the number 1043 raised embossed on the underside of the metal base. Condition: Signs of wear throughout commensurate with age. The reverse gold painting on the interior of the glass globes shows separation, crazing, and other issues, particularly around the underbelly of each form. 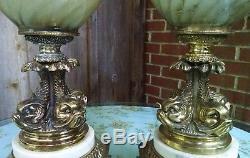 Exterior gilt color & condition varies and differs between the two lamps. 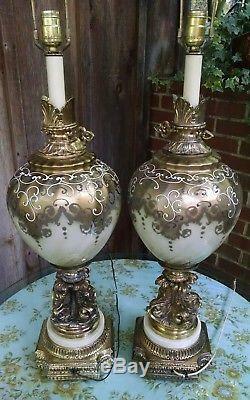 Each lamp in this pair will need a protective table felt across the bottom, a lamp shade, a light bulb, and possibly rewiring for pace of mind. As is they are in working condition and light when plugged in. Original Harps & Finials included. We're happy to answer them for you! 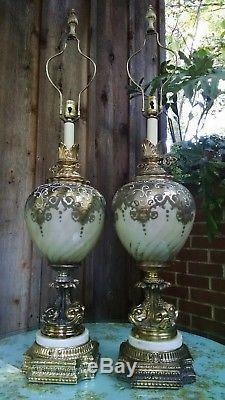 These grand table lamps and have terrific presence. They are extraordinarily handsome and will inherently add a delicious sense of opulence to your environment. Thank you for having a look at our item. We love this and know you will too! Treat yourself well while thinking of others too, and embrace the adventure of your life's unique calling, rain or shine, because it is ALL a gift. Note to Our International Friends. On Other: We hope you'll inspire someone special by making the investment and adding this delightful piece to their permanent private collection, or to your own! Enjoy our detailed photos and listings, and shop here with confidence. Please be aware that all antique, vintage and used items will show wear commonly found with age, use or wear, and any major flaws will be noted. The photos have been taken for your viewing, can be enlarged for a closer more detailed look, and should be considered an integral part of the description. All items are described to the best of our ability and knowledge. Thanks so much for your interest! Choose to be stylish because it makes life simply marvelous! 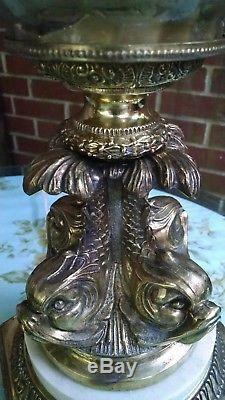 The item "Hollywood Regency Gold Gilt Bubble Table Lamps Mid Century Movie Prop Koi Fish" is in sale since Tuesday, November 21, 2017. This item is in the category "Antiques\Periods & Styles\Mid-Century Modernism". 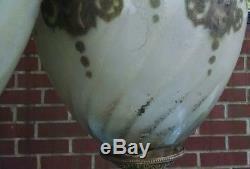 The seller is "uniqueantiquesusa" and is located in Kingsport, Tennessee.